How to clean EGR Valve? So tomorrow is officially clean up lude day for me, so I've been reading around and I wanted to clean my EGR valves?, if that's what its called. Does anyone know how to do this? Wheres it located pictures and step by steps would be excellent. thanks. Re: How to clean EGR Valve? Look in the DIY Engine section and you will see a video on cleaning the EGR with step by step instructions. Good luck. In case you couldn't find it. its on the right side of the head, two 12mm bolts on the top. Might have to remove your engine coil if its in the way mines not located in the way. But you just need a 10mm to remove the bots on it. Pull the EGR valve off, use carb cleaner in the ports make sure your pin moves up and down smoothly clean it to. i would go to autozone or whereever buy a new EGR valve gasket for 2 bucks might as well if your going to have it off i did so you have a clean seal and what not, after about 120k miles they could use a new gasket anyways. bolt it back up and your good to go! Just did mine this weekend. The Advance Auto Parts and Auto Zone near me didn't have a slide hammer to rent or for sale, almost thinking they might not have known what it was because I did find this in the auto body isle. at $15 you can't get anywhere near finding one for that price, just limited on what screws you can use. I tossed the packaging and receipt so I'm not sure if that's the exact screw but there were a few there and you just had to make sure the head would fit in the slide hammer tip. Then just some carb cleaner and you should be good. Mine was quite disgustingly filled with carbon but once I was done and put everything back together car started up, stuttered for a second then ran extremely smooth. Reset my CEL, which I did have P0401 and P0133. Drove a little bit extra than usual over the next two days and still no CEL coming back. I did also clean the EGR valve before this but the CEL came back pretty quickly afterwards. Also from what I've seen so far, about 120 miles, I'm getting significantly better gas mileage. I'll repost with what I get from a full tank later. Last edited by Scorpius; 09-19-2011 at 01:15 PM. Reason: Linked wrong drill bit and tap. I can't view that video or thread, the first one, because I have made 0 posts... so in response, I'm posting this message. Please don't be too upset. well someone is always upset somewhere, dont sweat it. are you just trying to clean the valve or the ports too? what scorpius is talking about is making a slide hammer tool, to pop out the egr port caps [right below your fuel rail; probly orange covered in soot]. these are a part of your intake manifold, and arent the easiest things to get at. you are supposed to do that when you clean your egr valve, which is alot easier. just get a socket extension, ratchet, and a 12mm? i think socket, disconnect the electrical connector and the small hose that is attached to the valve. grab your carb cleaner, and just spray the snot out of it. if you can press in the black "button" on the valve and it returns, the valve is ok. if it doesnt move, or is sticky, you might need a new egr valve. as far as the ports go, buy the replacement caps from honda first, you put then in after you remove the old original caps. or just buy another intake manifold. Does video show to clean the carbon off? Thanks for that video I hope to view. hey guys where can you buy extra plugs aka EGR port caps. in the video the guy used a drill bit to take them out since he didnt have a slide hammer. im doing the same thing but id like to replace my plugs. 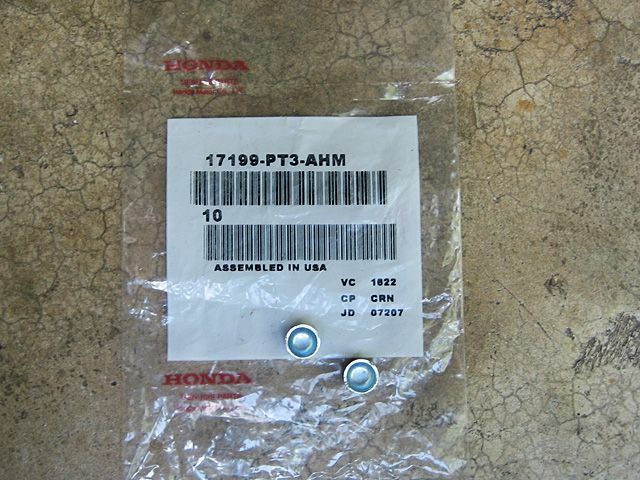 apparently honda thinks they dont sell these separately. if anybody has a part # that would be great. Last edited by mugenmaster; 03-24-2012 at 01:46 PM. Last edited by TheJGB3; 04-27-2012 at 07:21 PM. i would recommend to anyone doing this to get a few extra plugs, those things are small/hard to hold on to and i know when i did mine i dropped a few and couldn't find them. They come in a pack of ten, so just buy the whole bag for $3.70. I need to post to view the video as I need to clean out my EGR valve as well...P0401 was what came on when I went to get the engine check light diagnosted. Thanks for the video hope this fixes the issue.